Photos by Brandon Macz: Plans are being developed to improve the East Prospect shoreline street end in 2019. The East Prospect street end has one park bench, and is need of removal of blackberries and other invasive species. The Beaver Lodge Sanctuary at the end of of 37th Avenue East. “Over the course of years, when we first became aware of them 30 years ago, there was no policy, no permit system, and basically the neighbors next to them would take them over,” said Karen Daubert, cofounder of the Friends of Street Ends (FOSE). FOSE members Gene and Liz Brandzel continue to steward the Beaver Lodge Sanctuary they created with the Madison Park community at the end of 37th Avenue East. Gene Brandzel is also leading an effort to improve the street end at East Prospect Street, just north of the Seattle Tennis Club, but solid designs have not yet been finished. Akkari said East Prospect has access to Lake Washington by two levels of gravel path. The biggest issue with this street end is removing blackberries and other invasive species, which will help the native habitat. 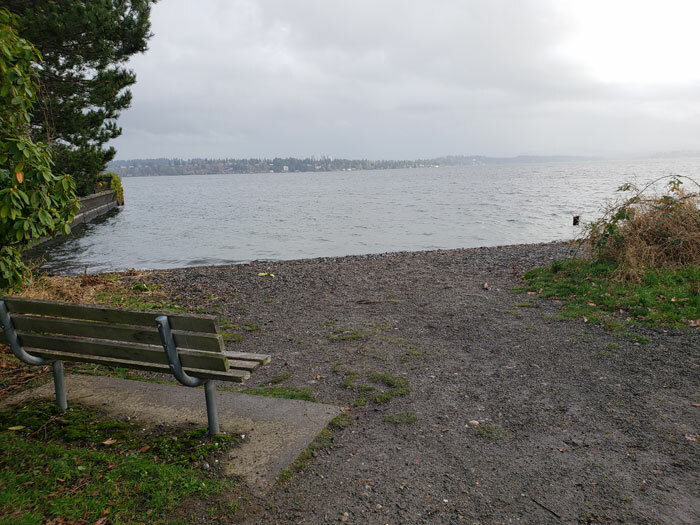 There is one bench overlooking Lake Washington. Brandzel said the former owner of waterfront property on the north end of the street had not been keen on seeing improvements. “He was imposing all kinds of requirements on us to avoid having him make a big stink about it, so we just decided at that point the hassle wasn’t worth it,” Brandzel said. That property owner has since sold their home, and Brandzel is working on a design concept for improving East Prospect now. “It’s just going to require a lot of different skill sets,” he said. East Highland Drive is a great example of what happens when neighbors support a street-end improvement project, he said. Brandzel approached adjacent property owners Scott and Shirley Wilson about the project, and they got involved. The issues with the street end were similar to what had once existed at the Beaver Lodge Sanctuary. When a tree fell, the Wilsons spent their own money to turn it into benches for the street end. She added East Mercer Street is also in need of improvements, with access blocked by a cypress hedge running parallel to the street and shoreline. Three open shoreline street ends Daubert recommends in the neighborhood are the Beaver Lodge Sanctuary and East Lee and Highland streets. 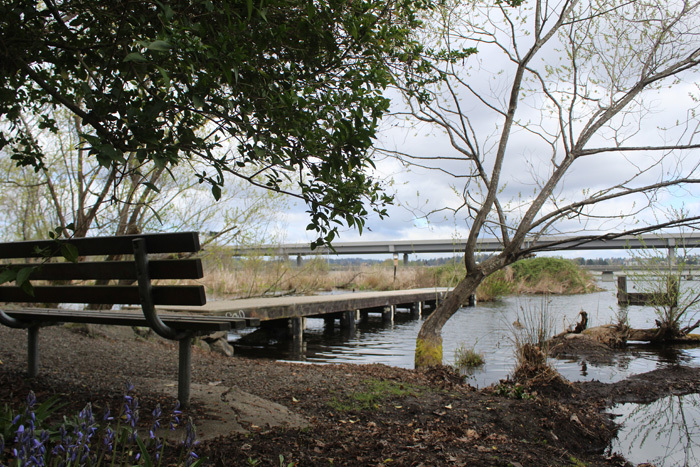 Community-led improvements, such as with the Beaver Lodge Sanctuary, are supported by SDOT, which provides collection of vegetative and manmade waste gathered during work parties, plus design and permitting assistance. 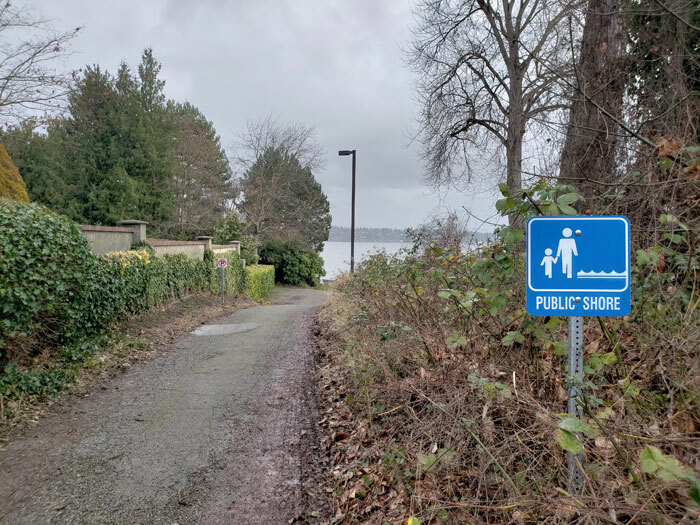 Public access to shoreline street ends isn’t always explicitly written out, and many people are not aware they exist and where to find them. SDOT has maps of improved and unimproved shoreline street ends online, and Akkari plans to have signs installed at 30 locations over the next two months. “There are a lot of these spots that are kind of under the radar,” he said. Akkari is also working to create a volunteer program for improving and maintaining street ends within an existing Trees for Seattle program that focuses on habitat restoration. Residential lot owners won the right to the shoreline right-of-way around their properties on Northeast 130th Street in 2016, after challenging the City of Seattle’s plans to improve the street end. The case was decided in the Court of Appeals, and the state Supreme Court declined the city’s request for review. So Akkari is also working on an ordinance directing how public shore ends are added and removed, and what is no longer considered right-of-way. FOSE will hold its first meeting of 2019 from 6-8 p.m. Thursday, Feb. 28, at Oppenheimer Camera, 7400 Third Ave. S.